NOTE - RG6 cable, tacks and ties are available in black or white - please specify - if you do not specify colour, I will send black. I will crimp the aerial end of the coax cable with a weatherproof connector ready for attachment to the aerial, and supply the connector for the TV end that you can fit yourself after running the cable unless you specify otherwise. If you want a variation of this eg. 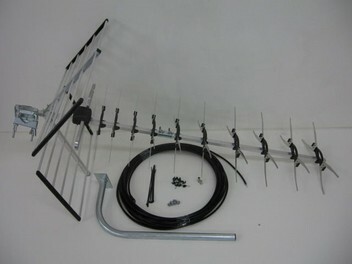 Different aerial, different type of mounting, staybars, shorter/longer cable, jigger boom... please ask.